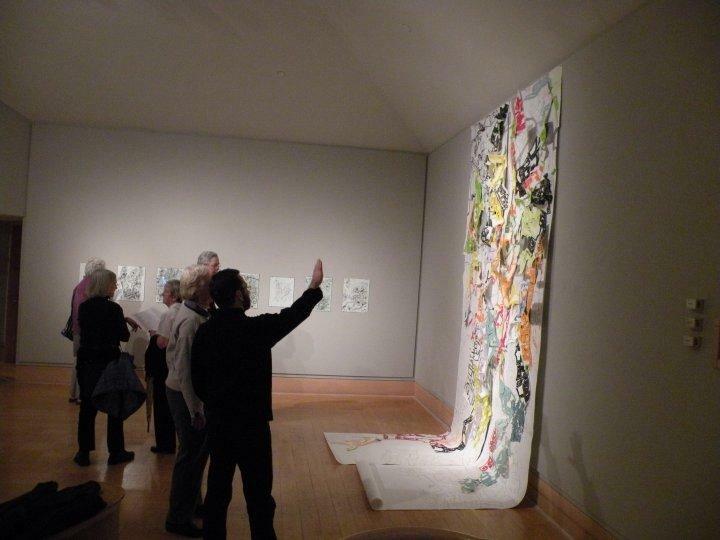 The Wriston Art Galleries are an integral part of Lawrence University’s vibrant academic community. The Galleries are dedicated to enhancing a Lawrence education through exhibitions, student internships, object study sessions, research opportunities, visiting artist lectures, gallery tours, and other opportunities and events. The Wriston Art Galleries staff are eager to assist all Lawrence University faculty with integrating objects and works of art from its collections into their courses and research. Please contact the Galleries' staff if you are interested in learning more about these research and teaching resources. The Wriston Art Galleries offers internships in museum and gallery work to Lawrence University students. Interns will receive hands-on experience in collections care and management, learn exhibition and installation practices, conduct research on visual and cultural objects, curate exhibitions, and explore issues relating to museum governance, politics, and education. The internship positions run during the Fall, Winter, and Spring terms and Summer recess. Eligible students should be declared in a major area applicable to museum work and demonstrate an interest in museum professions. Student interns must be available for a minimum of 3 hours per week, Monday through Friday between the hours of 8:00 a.m. to 4:30 p.m. Contact the Galleries' staff about open internship positions. A n object or print study session is a unique opportunity for Lawrence University students and faculty from any department or area, as well as other approved scholars, to research original works of art and cultural objects from the Wriston Art Galleries’ permanent collection in person. Contact the Galleries' staff via phone, email, or by visiting the gallery offices (Wriston 227). Sessions may be scheduled on weekdays between the hours of 8:30 am and 4:30 pm. Groups and classes must arrange object study sessions in advance. Please make object study session appointments at least two days prior to the intended visit. When arranging an appointment for a study session, please include a list of the artists, artworks, or objects you are interested in researching. Please visit the Collection page for an outline of the Galleries’ major collections and a link to our Artstor database, or contact the Galleries's staff for suggestions. The Wriston Art Galleries reserves the right to deny any object viewing request or session due to scheduling conflicts or the condition of the work. The Wriston Art Center Galleries offers school groups and other organizations guided tours of its exhibitions during our regular hours. Please contact the Galleries’ staff by phone or email to schedule a tour and visit our Exhibitions page to see what is currently on view. Groups will be expected to observe standard museum etiquette guidelines during their visit to ensure the safety of the works of art and provide comfortable viewing conditions for all visitors.